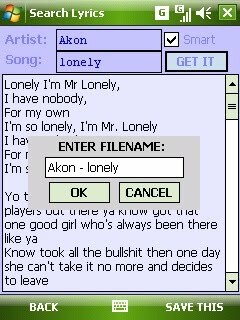 Get Lyrics is a windows Mobile application which lets users to download lyrics of songs and store them in the local database. It's very easy to use and self explanatory. This is a best application for Music freaks. You can store a lot of songs into its database. Kinetic scrolling allows you fast and easy access to your music.You will find yourself singing your favorite songs with the exact words. Comes with few pre stored lyrics but you can add your own anytime with just few clicks. For reporting any bug please send on depinder@gmail.com , bugs will be resolved and will be incorporated in new version.